Today we made slow cooker roasted salmon with dill cream. 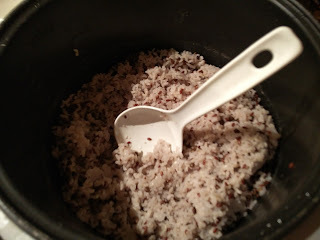 As a side we made brown rice with flax seeds and black lentils. It was a very simple recipe and one that you could just a few hours ahead of time and come home to a wonderful cooked meal. We enjoyed this one a lot. The sauce was probably the hardest thing to make and the least necessary. We actually forgot about the sauce until the very end. This is a very good juicy salmon, but for those who prefer a flakier and dryer salmon, this recipe is probably not for you. 1. 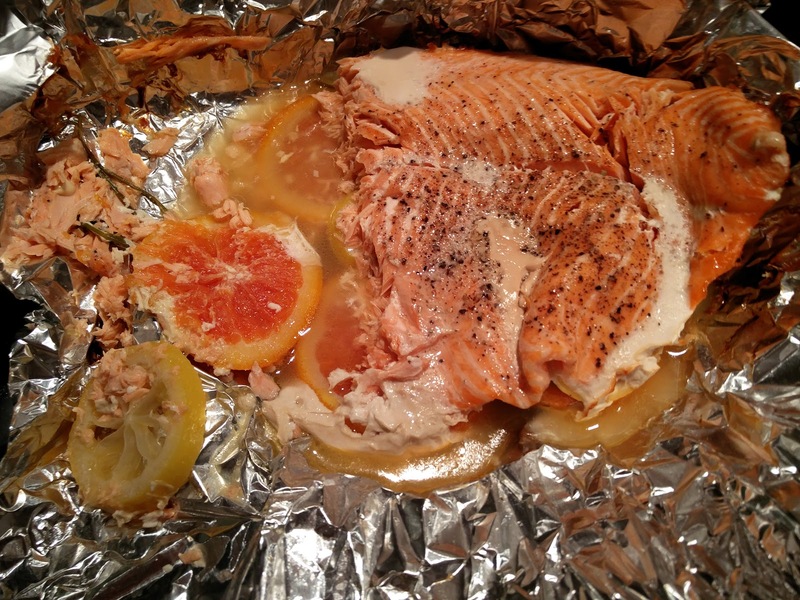 In a large, preferably oval, slow cooker, place a piece of foil long enough to overhang sides. Coat foil and slow cooker sides with cooking spray. 2. Chop enough dill fronds to equal 2 tablespoons; set aside. Line slow cooker bottom with remaining dill, orange slices, and lemon slices. Sprinkle with 3 tablespoons water. 3. Place fillet, on top of citrus, grind some salt and pepper on top. Cover and cook on LOW 2 1/2 hours or until fish flakes easily when tested with a fork or until desired degree of doneness.We have to use HIGH on our slow cooker, because for some reason, LOW does not seem to do anything at all. We cooked it for about 2 1/2 hours on high and it came out perfect. 4. While salmon cooks, combine reserved dill fronds, sour cream, mayonnaise, lemon rind, lemon juice, and mustard in a bowl; refrigerate. 5. When about 30 minutes are remaining for the salmon, put together all the ingredients for the rice in the rice cooker and start it on "white rice" setting. Quick and easy and delicious! The salmon was very juicy and tender and no "burn" or "dryness" on the sides that you get from the grill or oven sometimes. 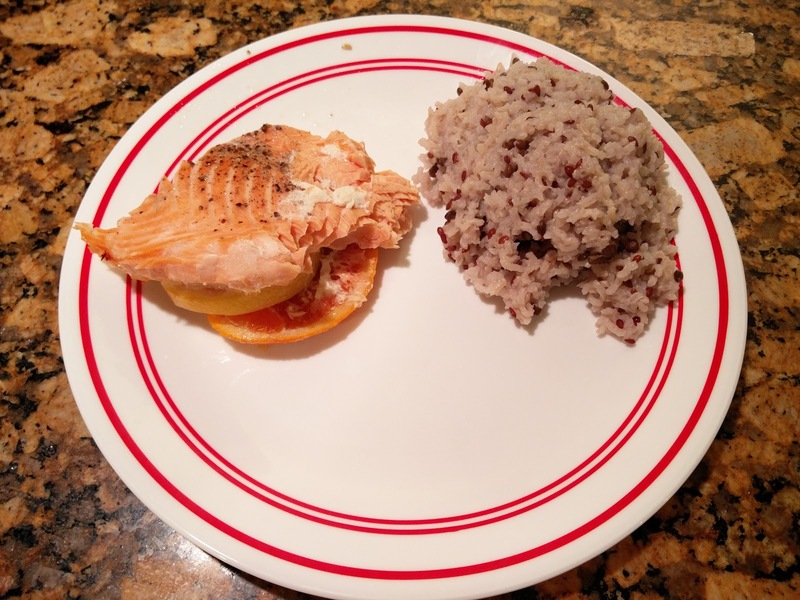 We loved trying a slow cooker salmon recipe. We had no idea you could cook salmon in a slow cooker and it come out so good! Nick liked that only one side was lemony (this is controlled by the lemon slice distribution under the salmon). The dill in the slow cooker didn't seem to add anything. Will probably do it without that next time. 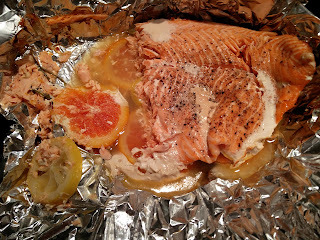 It was slightly difficult getting the salmon off the lemons and oranges as the salmon was so soft and flaky that pieces kept falling between the citurs. We also used a no-skin fillet though, it might have been different with a skin-on. He just wanted dinosaur chicken nuggets. Upon seeing his plate with rice and salmon, he moved to to the other side of the table and declared "I don't want that on my plate". Probably no dill. It would be fun to experiment with other slow cooker flavors for salmon...maybe soy and teriyaki? Maybe do a side salad as well.